Both sexes: Bright blue upper parts and orange-red under parts. Their flight is fast and direct and often very low over the water, and so all you see is a bright blue flash as they pass by. 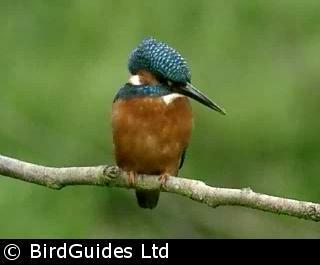 There is much dispute as to whether Kingfishers have a song. Whether or not they do, the commonest call is a shrill whistle "chi-keeeee". Freshwater fish are the main part of the Kingfisher's diet, but they will also take aquatic insects and more rarely crustaceans, molluscs and small amphibians. When fishing, they perch on a branch over or close to the water watching and waiting for a fish to swim by. They dive in to the water for the fish, inevitably catch it, and then return to the branch where they will stun the fish before swallowing it head first. The nest is usually in a tunnel, 30-90 cm (12-36") long, in a bank next to slow-moving water. The tunnel is excavated by both sexes and is not lined with any material. The eggs are white, smooth and glossy, and are almost round at 23 mm by 20 mm. The male and female take turns incubating the eggs, and both adults feed the young. British birds are mainly resident, but in the winter harsh weather may force birds towards the coasts. From mid-summer to autumn, young birds move away from their natal grounds, though rarely further than 50 km (30 miles). 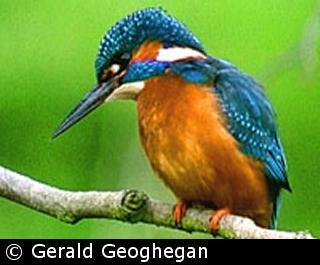 Kingfishers have returned to many once polluted rivers in industrial towns and cities. 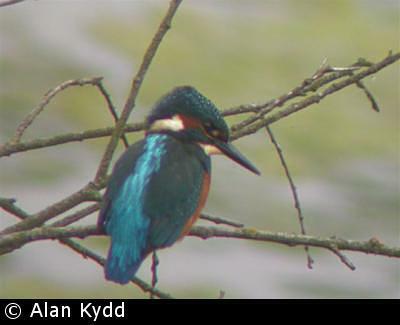 Despite this, pollution remains a threat, especially in Europe, and the Kingfisher remains an amber listed species of conservation concern.